Note that this was only tested on certain combinations like this (Windows 7 with iOS 8), this (Windows 7 with iOS 7), this and this (Windows 7 with iOS 9.3.2 (iphone 6s)). Windows 7 seems a possible Windows OS that can work. Recently, I tested it on Windows 8 and iOS 9. Unfortunately, it did not work. It seems iOS or Windows has changed its way configuring the network. So, if you are using newer OSes, an Ad-hoc wifi hotspot from your PC may be easier to set up to share the Internet connection of your PC to your iPhone. It is common and straightforward to make PC to use iPhone’s GPRS, 3G or 4G Internet connection through the USB cable. Now during the spring festival in the country, I am facing the problem that I am wanting to make my iPhone use the PC’s Internet connection. There is no router by hand and what I have is only the iPhone and USB cable. The PC is an old one with Windows XP installed. Finally, I figured out a way to make iPhone connect to the Internet through the iPhone’s USB cable to the PC Internet connection. The method here is tested on iPhone 6 with iOS 8.1.3 and Windows 7 / Windows XP. 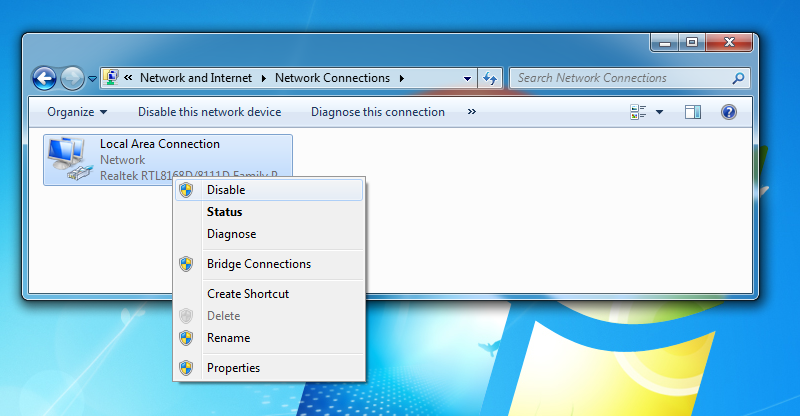 Step 1, disable the adapter for Internet connection in Windows. Step 2, connect the iPhone to the PC by a USB cable. 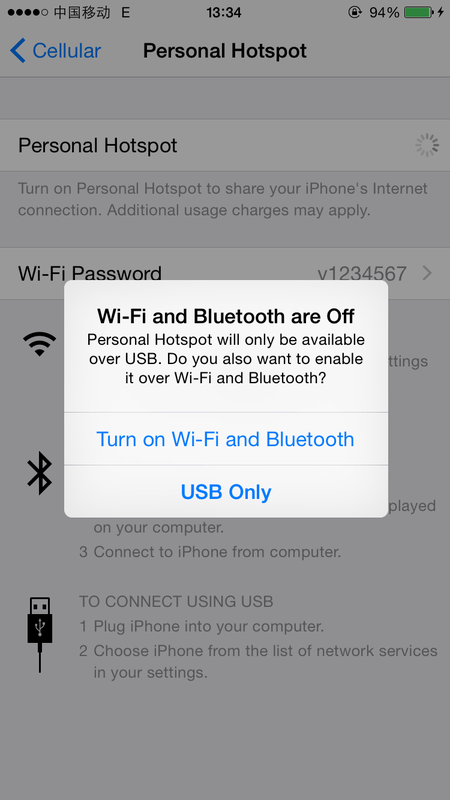 Step 3, in the iPhone “personal hotspot” settings, enable “USB only” Internet sharing. 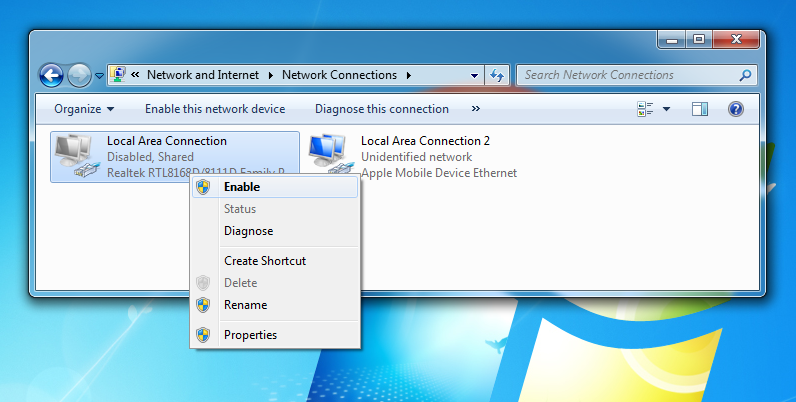 A new adapter in Windows will appear (“Local Area Connection 2” here). 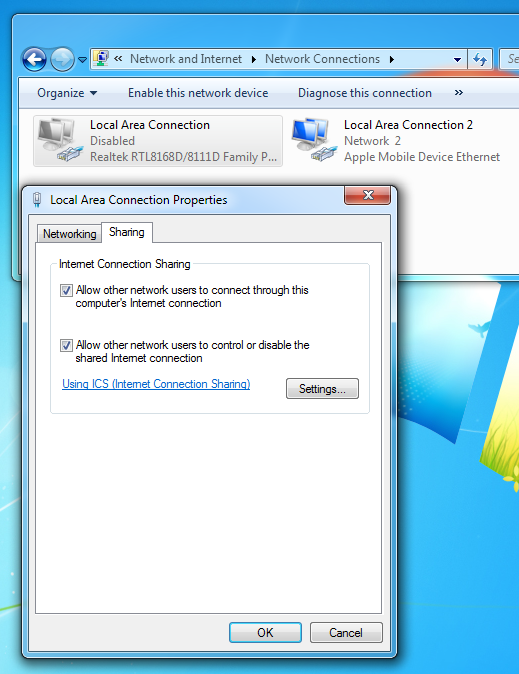 Step 4, in the property of the adapter for Internet in Windows, enable “Internet Connection Sharing”. In the “Settings”, select the needed services. Step 5, re-enable the adapter for Internet in Windows. Now, visit the Who am I service in your iPhone and check whether your IP is from the Internet provider for your PC. Following is just my guess since both Windows and iOS are closed systems. For easier to understand, I name the adapters as follows. After Step 1, the Windows routing table is cleared. After Step 2 and Step 3, both tun0 and tun1 are created and the network packets are forwarded between each other. Step 4 makes sure that network packets can be forwarded from tun1 to eth0 by Windows. Re-enabling eth0 in Step 5 set up the routing table as we needed. The final path for the packet routing will be as follows. What results do you get? Are there any error messages from Windows or iOS? My tests on iPhone6 with iOS 8.1 are okay. Making it work is a little bit tricky. You will need to follow exactly the order of the steps here. Some times, you may need to try several times. i have test several time but it’s now working. please view this image , so you’ll get idea exactly what missing. Seems problems happen before or on step 3. You will need to make sure the Windows successfully connected/recognized your iPhone as a new adapter. Do you have iTunes installed on your Windows. You may try to reauthorize your computer. A tutorial at https://discussions.apple.com/thread/5442841 may help. I have re-authorized my computer, but same problem. em.. no idea what’s wrong now.. You may also check whether firewall on windows blocks the connection? whether the reverse normal path (use iPhone network for Windows) works? I have tried this with my iPhone 5 and Windows 7. Instead of my iPhone using my PC’s internet connection, my PC is using my iPhone connection. Any ideas? The mechanism re-used is from iPhone to let PC use iPhone’s data network. The methods here “tricks” Windows and iPhone to use the reverse connection. The method here should be followed exactly according to the steps. Otherwise, the trick likely fails and it works the normal way that PC uses iPhone’s data network. 1. PC connects through iPhone like normal tether. 2. PC connects to internet on its own as normal. iPhone connects using cellular. 3. PC connects to internet on its own as normal. iPhone has no internet connection and shows up in Network … Center as “Unidentified Network”. After my last attempt, the Sharing tab under Local Area Connection Property has disappeared. Any ideas how to get this tab back? If you can take the screenshots as in the post and upload them to some where, I can take a look whether I have some clues on what’s wrong. actually the tab is missing because there only 1 connection(network) . when u put 2 network, then the tab sharing is appear..
lats time i have did all the steps you have given us here ..
i would be glad if you help me ! Minding restarting Windows and even iPhone? This might sound a silly answer. But sometimes, it is the solution. it didnt work so I guess it does’nt work or there’s a bypass which I don’t know. Tried with the proxy and it didn’t work for me. But I want to know if my cellular data being on before I start the process should be a pre-requisite or should it be off? Thanks. What kinds of proxy are you using? The cellular data should be on so that you can have step 3. I work in a university faculty so our internet has an http proxy that has to be put in the internet settings before it works. So that’s the type. You may need to check and ensure “Windows Firewall/Internet Connection Sharing (ICS)” service is running. 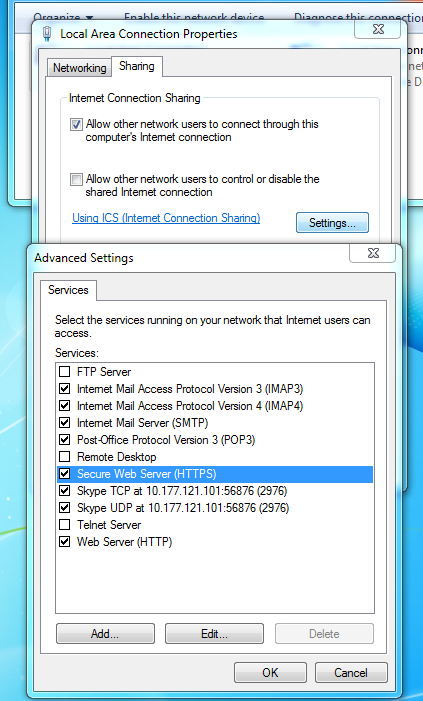 Hi Samuel Eshun, so the proxy setting are put into “Internet setting” or somewhere similar? I am afraid the method here will not work for this situation. They work on different levels. I run it on Windows XP when I figured out this method. I tested on Windows 7 with iOS 8 when I wrote this post. You may need to enable ICS service: http://www.systutorials.com/136003/iphone-connecting-internet-using-windows-pc-network-through-usb-cable/#comment-71547 Google can give you solutions on various Windows versions for this. I used xp but after several attempts and following your exact steps my iphone did not want to use my computer’s internet. It instead only used my cellular data to access the internet. Oh and yes I did then try disabling cellular data to force it to use the internet sharing from my computer but it wouldn’t connect at all. Oh and the internet sharing option only appears when there is another internet adapter connected and detected by your computer. That’s why it dissapears after you disconnect your iPhone. I believe jailbreaking is the only way you could try to do this but I have yet to find a tweak that does it. I’m out of the country and was hoping to do so while here in my dorm room with only a wired network available but it seems I can’t have cellular turned off which doesn’t work for me as I’m not wanting to pay roaming costs. Any other options? if we have to turn on the “USB only setting” that means we have to enable the 2G/3G (mobile data) must right? without enabling the 2G/3G (mobile data) we cant access that setting…once if we on mobile data then internet (mobile data) will take from iPhone only right? then how above trick will work?? but you mentioned about the above trick you are using internet from PC to iPhone (not mobile data) is that possible?? please confirm and correct me if i am wrong…i want to use my PC internet in my iPhone 4S (not mobile data) through USB cable. You need mobile data to “activate” the network flow. Please note that it is only tested working on specific versions of iOS as stated at the beginning of the post. can we share internet from windows 8.1 to i phone 4s? I am not sure. You can have a try. There are limited number of combinations that work following this tutorials. Please share with us if it works for you. I can’t open personal hotsopt in ios 9.2 without enabling cellular data. Please advice something …. You are lucky having it working for you! Could you share with us your versions of iOS and Windows? From my previous experience, you may restart iOS and try again. It may work again for you. If it ever worked for you. You may try to restart both you iPhone and Windows, then follow exactly the steps in this tutorial. It might work again. sir i just clear the step in that system shows Network Shared. Please tell the next step, what should i do to start internet in my iphone. Sir,thank you very much, it worked Windows 7 with iOS 9.3.2 (iphone 6s),but can’t worked to ipad mini2. Great to know it works for you! You know, it is hard to make this work. The solution is picky in the combinations of Windows and iOS and device. Thanks for your sharing! Sir, why is the sharing tab instead says windows- -i forgot is corrupted. I tried system restore and it still hasn’t worked. Any tips on how to fix this? Thank you for the tutorial. Unfortunately, as soon as I shut off cellular data my personal hotspot shuts off. The same thing happens if I switch to airplane mode. Is there a workaround to this? I am using Windows 7 and IOs 9.3.2 on an iPhone5. If I don’t shut off the cellular data, my phone connect to the internet through cellular. What if I want it to be the other way around? I want to connect my windows pc to my iPhone’s data .. is this possible? In many cases, yes. On my phone, in settings I turn on personal hotspot and then use a USB cable, WiFi or Bluetooth to connect the PC to the internet using my cell phone’s data plan. But I’m using a desktop .. will it work? I have followed the same steps. the newtwork is shared in my PC but how can I understand, that I am using the PC internet in my iPhone 6s becuase the 3G is also ON and Hotspot is connect with my PC. If I turn off my cercular data, the hotspot will disconnect otherwise I cannot use the PC internet. was able to setup the connection successfully but it took all the internet bundle on my phone. i thought it will share my Pc internet with my iphone and not otherwise. how do we know if desktop is using mobile data or otherwise? hi , i have tried but in the Network connections is showing , Netwotk cable unpplugged for the Local Area Connection2 , that is the Apple Mobile Device Ethernet. I did, but it says..your iphone internet is connection is being shared over usb. hello it worked on my iphone but some applications are not working thank you alot . Thanks a mmmilllion for this post!!!!!! The rest you may find on internet including Mac help has been absolute crap, but this saved my afternoon!!! ..one thing – you have Skype listed in Services, but I don’t and Skype says it can’t connect. I tried to add it, but I must have done it incompletely as it is still not working. Can you please give me a clue of right way of adding it?…. First of all thanks for the post it worked for me I do not understand how it works but it did work for me 4 times on windows 7 and 10 and iOS 11.3. However after these attempts I never got it working again windows just says Unidentified network after I enable network sharing of my other network card I really would like to get it to work again can you help me? It is a surprise for me to know it worked for you with iOS 11.3. I originally got this method from iOS 8 + Windows 7. Thanks for sharing this info. – stick with Windows 7. It was successful for iOS 8 and iOS 9. – do a clean reboot of Windows first (and iOS too) before trying again. Good luck and hope you can share your good news further. Thanks a mmmilllion for this post!!!!!! The rest I could find on internet including Mac help has been absolute no-help, but this saved my afternoon!!! ..one thing – you have Skype listed in Services, but I don’t and Skype says it can’t connect. I tried to add it, but I must have done it incompletely as it is still not working. Can you please give me a clue of right way of adding it into the “Services”?…. Thank you very much in advance!…. It seems you have made iOS connect to Internet through a Windows PC? That sounds great. The “Skype listed in Services” must be because the Windows 7 node I used had Skype installed. – manually allow those ports used by Skype. 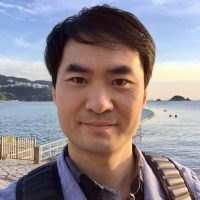 Ref to https://support.skype.com/en/faq/FA148/which-ports-need-to-be-open-to-use-skype-for-windows-desktop for the ports needed.